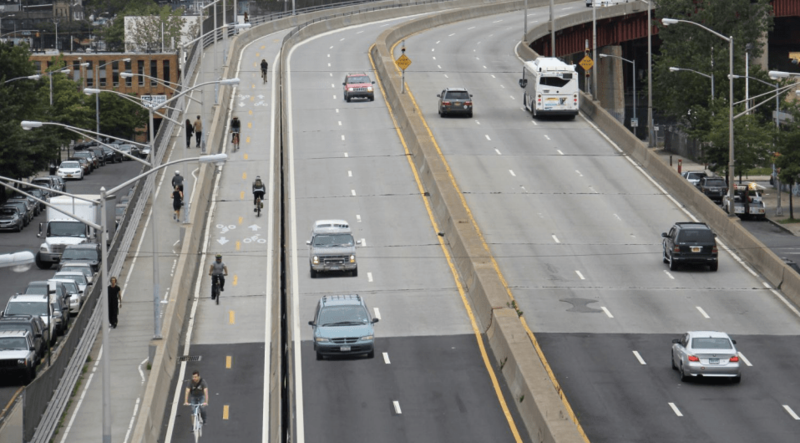 By this time next year, people walking and biking across the Pulaski Bridge between Brooklyn and Queens won’t have to share a single narrow path. With a new, two-way protected bike lane spanning the bridge, cyclists will have a safe route and pedestrians will have the existing 8.5-foot wide pathway exclusively for walking. No more fighting over scraps of street space. The only remaining milestones are final approval from state DOT, followed by NYC DOT moving ahead with a contract for construction — though the agency isn’t sure it will finish the project in time to help people looking for alternatives to the G train during a scheduled closure next summer. The news came at Tuesday night’s meeting of the Brooklyn Community Board 1 transportation committee, which voted unanimously to support the project [PDF]. DOT also presented the plan at the transportation committee of Queens CB 2, which is waiting for more design details before taking a vote but expressed support for the project earlier in the planning process. The need for more space for walking and biking is clear: In 2009, DOT added new striping for pedestrians and cyclists to the already-busy sidepath. Since then, the number of cyclists crossing the span has more than doubled, while the number of pedestrians has increased 47 percent, according to DOT counts. 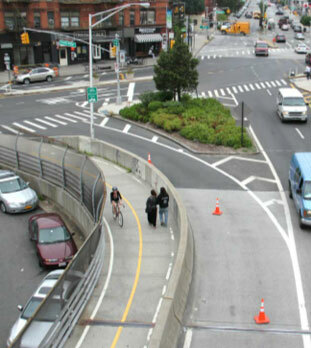 On the Queens side, the bikeway entrance to the bridge will be carved out of this car ramp and the planted traffic island. The path will run on the west side of the bridge, replacing one of three southbound car travel lanes over Newtown Creek. Existing peak-hour traffic volumes on the bridge can easily be accommodated in two lanes, DOT’s Hayes Lord said, and the new two-lane configuration, matching the number of lanes on speed-plagued McGuinness Boulevard, will reduce merging and speeding by drivers as they drive into Brooklyn. On the Queens side, the new bike path will curve alongside the existing walkway, which hugs a one-lane ramp that drivers use to access the bridge. To make room for the new bike path on the existing ramp, DOT will trim back the size of a Greenstreets traffic island at the bridge entrance. Drivers using the ramp will merge with southbound traffic from 11th Street entering the bridge, instead of continuing in the same lane as they do today. Earlier this week, Council Member Jimmy Van Bramer called for safety improvements in this area, near the intersection of the Pulaski Bridge, 49th Avenue, and 11th Street. The path will route cyclists on the Brooklyn side to the pair of one-way bike lanes on Freeman and Eagle Streets, which connect to Manhattan Avenue and the Brooklyn waterfront. Committee members asked DOT to present the plan to CB 1’s full board in January and provide more details, including designs for entrances to the new path on both sides of the bridge. DOT will install a concrete barrier topped with a metal railing between the bike path and the two southbound car lanes. The concrete barrier along the existing path will remain, but will be removed along the drawbridge section and replaced with plastic posts to separate the bike and pedestrian paths. This configuration will allow cyclists to stop at the seating area that faces west, toward the Manhattan skyline. The Greenpoint tube, which carries the subway underneath Newtown Creek, is scheduled for a five-week closure next summer for Hurricane Sandy repair work. “We would like to have this already in place before the G train shuts down, but it might not happen,” Lord said. The city, which began studying the bike path last year and started engineering review last spring, applied for federal Transportation Enhancement funds in August and sent the project to state DOT for review six weeks ago. NYC DOT is still awaiting the state’s approval but expects it in the coming weeks. Once the state signs off, DOT will put the Pulaski Bridge project, which costs $3.46 million, into a larger contract containing 10 other small bridge rehabilitation projects. DOT staff said Tuesday they were hoping to place the Pulaski Bridge project first in line for implementation on the contract. “We do anticipate that the construction portion will only take a few months,” Lord said. While he could not guarantee completion before the G train shutdown, he did say it would occur sometime next year. This makes me want to move Streetsblog HQ to Queens. Fantastic! Hopefully, this will have a side benefit of slowing down cars on McGuiness a bit. Kudos to all the people that pushed for this. ‘Bout time! There’s no reason for that bridge to be 6 lanes since McGuiness is only 4. It narrows down as soon as you get to the Brooklyn side anyway. I don’t understand this propencity to build bridges bigger than the roads that feed them (cough cough, new Tappan Zee). My commute just got easier!! We would love to welcome you to our fair borough, aka the center of the universe and the cradle of civilization. I was just thinking this. I love this video, Clarence. One of my all time favorites! I’ve often felt more comfortable riding in that lane than in the bike/ped lane on trips back from Queens. Capacity is so high on that bridge – drivers would just move over a lane and pass. Never once even been honked at. A good indication that the lane just wasn’t needed for motorized traffic. Thanks for all who helped with this. This is awesome! Thank you Joe Lentol! This might be future-proofing, if they expect approach roads to be widened in the future (building a 8-lane bridge is far less expensive than building first a 6-lane bridge then enlarging it to 8 lanes with additions later). This is the most exciting news I’ve seen in a long time. This is excellent to hear and a big thank you is owed to Marin Tockman, Julie Lawrence, Moses Gates, and many others who really got this on DOTs radar many years ago and refused to ease up since. The only big question I have though… $3.5 million!? What the heck costs so much in this project? It’s just jersey barriers secured to the road bed and minor changes otherwise. Is cutting back the greenstreet a little really that much of an extra expense? Don’t forget the Queens Community Board 2 improvements scheduled to come, so now more of industrial Long Island City will have some form of bike facility (i.e. Skillman Avenue south of Thomson Ave.) So according to your route, possible the only unmarked streets you’ll be riding is only in Manhattan. This is a no brainer. There are only four lanes on either side of the bridge. Not that progressive, but definitely needed.